The Duarte Province is a Dominican province; it is found in the northeastern part of the country. It has the name of one of the Founding Fathers of the country, Juan Pablo Duarte. It was created in 1896 as a district (an old country subdivision) with the name Distrito Pacificador but the Constitution of 1907 changed all districts to provinces. In 1925 its name was changed to Duarte. The Duarte province is bordered on the east by the María Trinidad Sánchez and Samaná provinces, on the south by the Monte Plata and Sánchez Ramírez provinces, on the west by the La Vega and Hermanas Mirabal provinces and on the north by the Espaillat and María Trinidad Sánchez provinces. The area that currently forms the Duarte province was originally part of La Vega province until 1885 when it was made part of the Espaillat province. 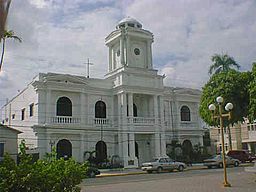 In 1896, this part of the country was made a province, including some coastal towns that are now part of the María Trinidad Sánchez province. With the creation of this last province in 1959, the Duarte province lost all coastal areas and became a landlocked province (surrounded by other provinces by all sides). At this time, the municipalities of the Duarte province were San Francisco de Macorís, Castillo, Pimentel and Villa Riva, with Hostos as a municipal district. Arenoso was made a municipality in 1993, Las Guáranas in 1998 and Hostos (with the name of Eugenio María de Hostos) in 2004. In 2010 (last national census), there were 289,574 people living in the Duarte province, and 191,878 (66.3%) living in towns and cities. The population density was 175.6 persons/km². Its population represents 3.07% of the total population of the country and the province is ranked as the 8th (out of 31 plus the National District) more populated province. As of 2016[update], the total estimated propulation of the province is 295,741 inhabitants. The largest city of the province is San Francisco de Macorís, its head municipality or capital, with a population (in 2010) of 149,508 inhabitants. Other big cities are Pimentel and Castillo. The Duarte province has a total area of 1,649.5 km2 (636.9 sq mi). It has 3.3% of the area of the Dominican Republic and it is ranked as the 13th (out of 31 plus the National District) largest province. There are two geographical regions in the province: the northern half with the Cordillera Septentrional (in English, "Northern mountain range"); and the southern half, in the Cibao Oriental ("Eastern Cibao"), the eastern part of Cibao Valley. There are two main roads in the province. The first road comes from Moca and Salcedo and goes to the southeast and then to the north to end in Nagua, on the northern coast. The second road is shorter than the first and is a branch of the Carretera Duarte (Duarte National Road) that ends in San Francisco de Macorís. Most rivers in the province are short and have their sources in the Cordillera Septentrional. Most of them flow to the south and are tributaries of the Camú or Yuna rivers; Camú is the main tributary of Yuna and these two rivers mark the southern limit of the province and flow from west to east. The climate of the province is a tropical climate but modified by elevation and the Trade winds (winds that come from from the Atlantic Ocean, filled with water), which blow from the Atlantic all year long. Rains are common in this province, mainly in the northern mountains where there are rainforests. The main economic activity of the province is agriculture; the main products are coffee in the mountains, rice in the southern and eastern part of the province and cacao in the low mountains and those parts of the valley close to the mountains. Other important economic activity is cattle raising. There are several industries, especially textiles and food, in San Francisco de Macorís. Duarte Province Facts for Kids. Kiddle Encyclopedia.